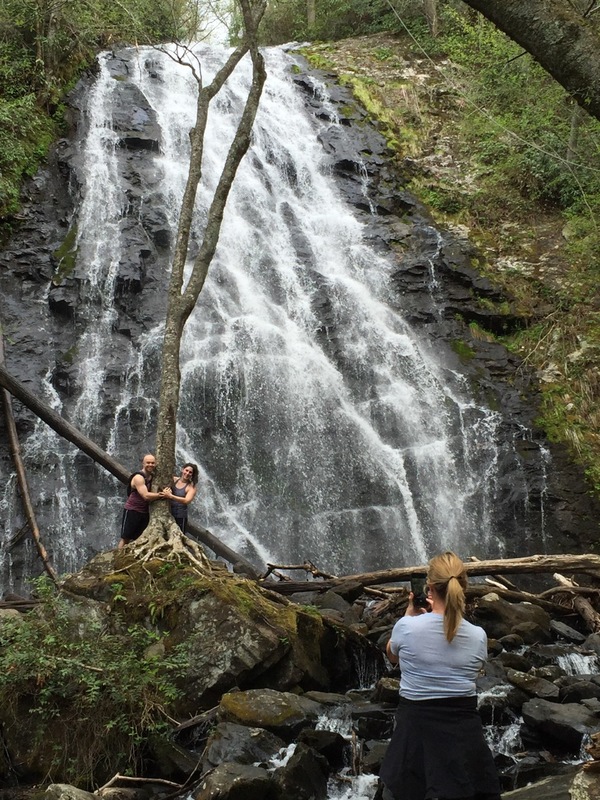 Crabtree Falls, a hiking destination on the Blue Ridge Parkway, is camera-ready. ASHEVILLE, N.C.–The trail started gently enough. We made a slow descent through the woods on a wide, mulch-laden path. Near the end of our one-mile hike down to Crabtree Falls, the trail grew narrower and steeper—and rocks and boulders of all sizes replaced the mulch. There was no turning back, though. We could hear the falls roaring. Finally, Crabtree Falls came into view: A pristine cascade of water dropping 70 feet. It was the kind of sight you often see on television, but seldom find for yourself. We shared it with only two other people—a couple from suburban Norridge, not far from our Chicago home. Crabtree Falls, about 45 miles north of Asheville on the Blue Ridge Parkway, is one of the many natural wonders in western North Caroina, where hiking and biking abound. 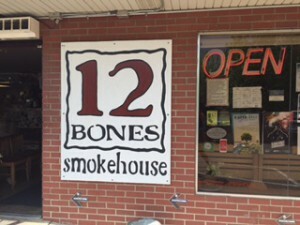 On our first trip to Asheville, my wife and discovered why this area is attracting retirees as well as tourists. 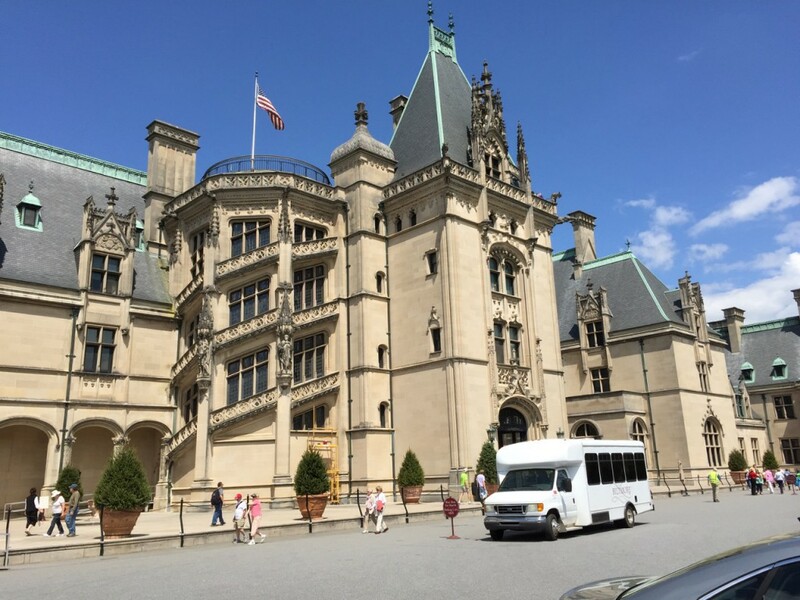 The late-19th-Century Biltmore Estate is an American cousin of Downton Abbey. Topping the sightseeing list is the 8,000-acre Biltmore Estate, an American Downton Abbey built by George Vanderbilt in the 1890s. After touring the house, visitors are encouraged to stroll through the elaborate gardens designed by Frederick Law Olmsted and visit the estate’s winery. Beyond outdoor activity and wonders of nature, Asheville is one of the nation’s craft-brewery capitals. It’s also gaining notice as one of the nation’s best cities for foodies. 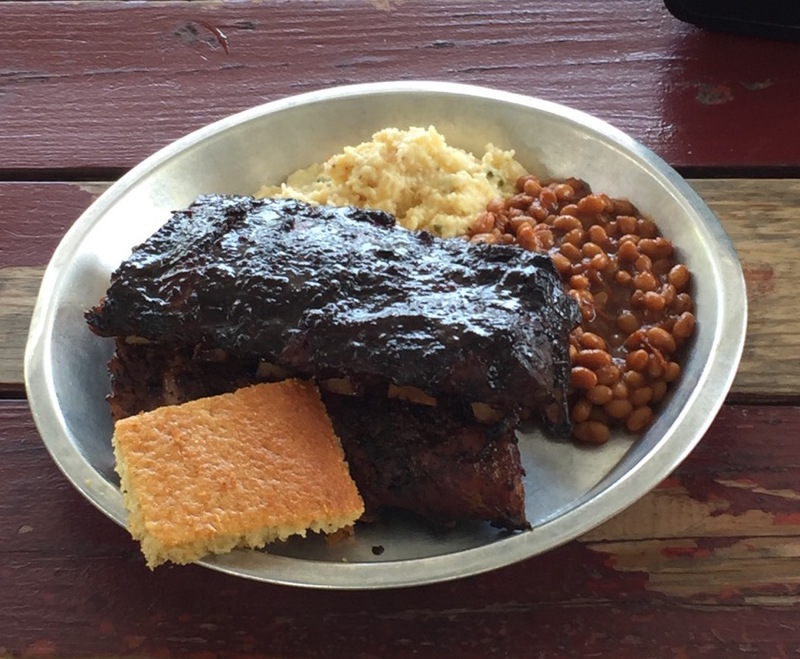 The proof was in the corn pudding, one of the many impeccable side dishes at 12 Bones, a remarkable rib joint in Asheville’s River Arts district, an array of restaurants, and galleries that has revitalized a tired industrial zone. Where 12 Bones shines is in its innovative sauces, including a blueberry-chipotle that raises rib cooking to a new level. President Obama has gone the blueberry-chipotle route on all three of his 12 Bones experiences. After trying it, we understand why. And don’t miss the jalapeno cheese grits. Beyond ribs, Asheville’s food options run the gamut from tapas to sushi, tacos to Cajun, noodles to Mediterranean. Strolling about Asheville, we were almost overwhelmed by the choices. With a population of about 80,000, Asheville’s downtown has a surpringly big-city feel, thanks to venerable buildings that have been restored to house shopping emporiums and galleries as well as restaurants and bars. We settled on a cozy outdoor table at Mayfel’s, where the slogan is “bringing the Bayou to the Blue Ridge.’’ It did not disappoint. This is a restaurant that would play well in the Garden District of New Orleans. The jambalaya was especially outstanding. 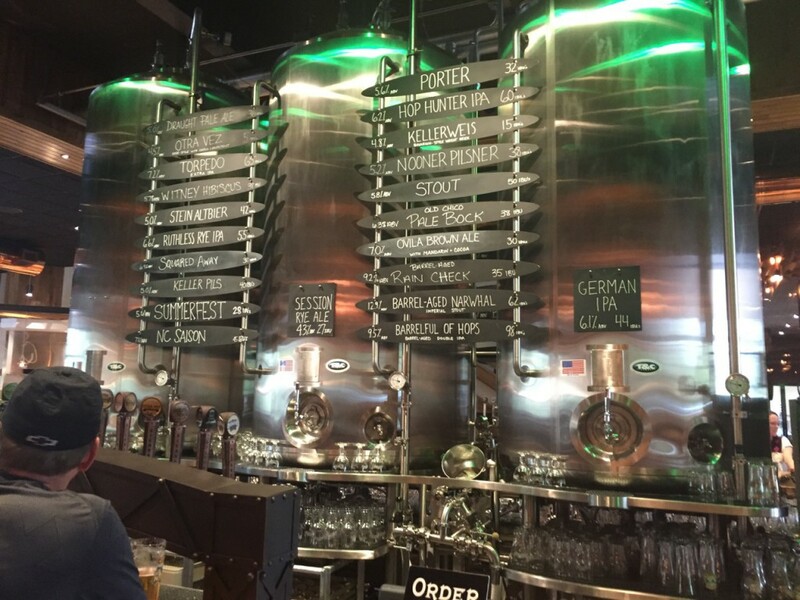 Sierra Nevada taproom has an extensive and innovative beer list. And then there’s the remarkable beer scene. Asheville has more than 20 craft breweries, the most per-capita in the nation, depending on where you draw the georgraphical lines. Larger craft brewers also are entering the area. When Sierra Nevada, from California, and New Belgium, from Colorado, decided to open eastern brewieries, they chose Asheville. New Belgium’s facility opened in the River Arts district last month. Sierra Nevada’s brewery, which opened last year near the Asheville airport, features a comfortable, modern taproom that can seat 400. The taproom also features a thoughtful menu that complements its beer, but easily could stand alone with items like smoked trout and kale Caesar salad, duck fat fries, and drunken Pale Ale oyster po’ boy. 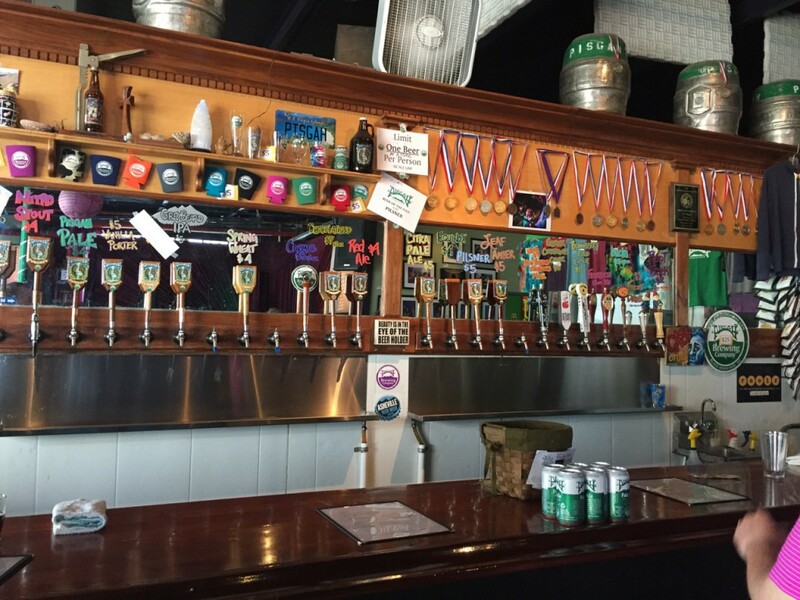 Pisgah taproom is cozy and rustic, with an inviting beer list. At the other end of the craft-brewery spectrum is Pisgah Brewing, named for the area’s national forest. Pisgah, which brews some of the area’s best craft beer, has a modest but comfortable tap room, and abundant outdoor seating. Located in small-town Black Mountain, about 14 miles east of Asheville, Pisgah also has an outdoor music venue that can accommodate more than 2,000 and is used regularly. In May alone, 17 concerts were on the schedule. Some require tickets, some are free. Bruce Hornsby and Ricky Skaggs will share the Pisgah stage on June 21. While North Carolina has been a state of national controversy due to its new law limiting protections for gay, lesbian, bisexual and transgender people, opposition to that law apparently is strong in the left-leaning Asheville area. “You have to be a Democrat to live here,’’ a woman who moved to Asheville from yet another Chicago suburb, Glen Ellyn, told us with tongue in cheek, adding that she has no problem with that, unlike her husband. The Obamas certainly enjoy the area. While a report that they have purchased a home site here remains uncofirmed, the First Famiily has visited the area three times, and has stayed at the venerable Omni Grove Park Inn, which opened in 1913. Ten Presidents have played at Grove Park, a Donald Ross classic with stunning views. Along with 12 Bones barbecue, Obama enjoys the Grove Park Inn’s historic golf course, a 1926 Donald Ross design that has been played by 10 Presidents. The course, reminiscent of Ross’ many Pinehurst layouts, takes good advantage of its beautiful rolling terrain. 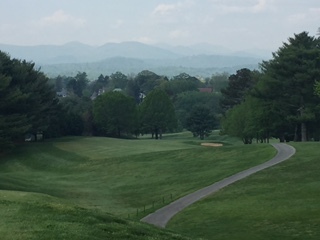 Afterward, relaxing on the inn’s patio, which overlooks the golf course and the mountains beyond, is recommended—unless the lure of barbecue or a craft brewery is overwhelming.